Jaguar XK120 OTS for sale, 1951, RHD, Chassis No 660296, Green Logbook, Regd No JER 335. A rare opportunity to buy an original, part restored XK120 open top sports roadster. Right hand drive, green logbook, reserved number. Matching numbers, club registered, last owner 15 years. Converted to rack and pinion steering, with disc brakes and koni shockers. 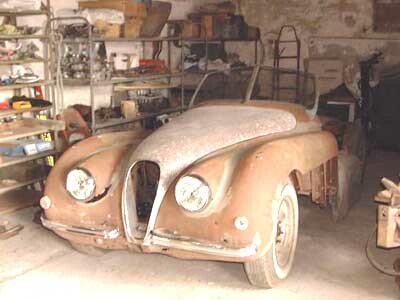 XK120 OTS Chassis Number 660296: Date of manufacture November 1950. First registered January 1951. Colour Cream, trim biscuit and tan. Current owner since 1986. Previously owned by JDC committee member. Regd Number is JER335, reserved at DVLC. Green log book. Work carried out: - Chassis straightened and jigged by John Timms (who built several concours XK's). Converted to rack-and-pinion steering. Parts supplied by John Wood, Bridport Jaguar. Chassis centre-member 'notched' for overdrive gear box (included) and fitted with telescopic shock-absorber plates. Engine block believed original, cylinder head probably Mk VII, restored by Bridport Jaguar. Original parts include full dashboard, seats, all engine accessories, front and rear suspension units, steel wheels, wiper unit, doors, boot lid, front body shell, bonnet and hinges, bumper irons etc original gearbox. New and restored parts include tripod lights, restored steering wheel, new horn push, disc brake conversion parts, XK150 disc callipers, XK150 telescopic shock absorbers, rubber bush kit, rechromed bumpers and hub caps, new seat frames, restored XK120 radiator etc. Part missing - steering column for rack and pinion steering. Rear body shell. Floorboards.